Join us in supporting our friends and neighbors impacted by the partial government shutdown. 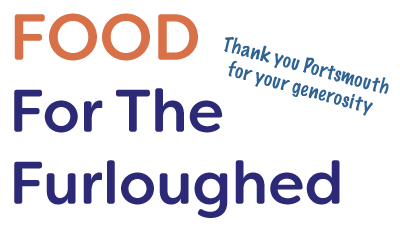 Donations made through this site will be used to purchase $20 Walmart gift cards that furloughed federal employees can use for essentials in their homes. Sometimes a little help goes a long way... If you are impacted by the federal government shutdown our local businesses are here with a helping hand. You are our neighbors, you are our friends, and we are here for you! If you know of other resources please email us details so we can keep this list updated. 9Round Portsmouth is offering all those affected by the shutdown FREE memberships for a month. We know how to beat stress, and that's to punch things! So we will be offering those affected and their spouses FREE 1 month memberships. The USS Albacore is offering free admission to federal shutdown affected employee families on Monday, January 21 for Martin Luther King Day. IDs required for discount. Albacore Park is open from 9:30 to 4pm. Bangor Savings Bank cares about our customers and our communities. If you are a customer impacted by the government shutdown, please contact our Bangor Support Team at 1-877-226-4671. Free one-time admission into the Children’s Museum of New Hampshire for impacted federal workers, their spouse and their dependent children. Must present employment ID. Learn more about the Children’s Museum of NH at childrens-museum.org. Cycle your worries away. Visit CycleFierce for a free month of riding. Simply create an account on CycleFierce.com and email the studio at ​fierceinfo@cyclefierce.com to obtain your free month credit. Dos Amigos Burritos, with locations in Portsmouth, Concord, Dover and Newburyport, Mass. and is offering free burritos to government workers during the shutdown. Joel Harris, owner, says “We pride ourselves on being part of the local communities we serve. If we can do something nice for a group of people who are having a hard time, we will jump at the opportunity to pay it forward.” All of Dos Amigos’ locations are featuring the free burrito with government ID program during the shutdown. Exeter Inn and Epoch Restaurant are extending their employee pricing to those impacted by the Federal Shutdown. Groups of four or less can dine at Epoch for 50% off your food selections. Rooms at The Exeter Inn are available for $49 per night. Visit them online at theexeterinn.com. As a community bank, one of our top goals is to provide personalized solutions for our customers and help support members of our community, particularly during the extended Government shutdown. FSB recently helped a local business who depends on the Government to operate each day. FSB was able to provide emergency financing backed by a fast, local decision and quality personal service. For more information visit a local branch or fsbdover.com. The Friendly Toast is here for anyone affected by the Government Shutdown. If you’re a federal or government employee, your meal (plus a guest’s) is on us! Present a proof of employment or Federal/Government ID and let us do the rest. (excludes appetizers + alcohol). Great Circle Catering in Portsmouth would like to offer 10% off any delivery over $100 as well as 10% off any customer pick up from our "Customer Pick Up" menu. Check out our website for menus at greatcirclecatering.com. 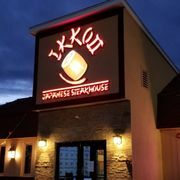 IKKO II would like to offer a complimentary lunch to any federal government worker during the government shutdown. Pick on entree from the lunch menu per employee, on us. Available Monday through Friday from 11 a.m. - 3 p.m. Also, receive 25% off of your bill during your normal dining visit with your family and friends, available Monday through Saturday only. Must present a valid ID or proof of employment. Offers are only available for dine-in guests. MVSB has a variety of options to support it's customers impacted by the government shutdown. This applies primarily to existing customers but if members of our community are affected we will support them in every way we can here at our Portsmouth location at 2839 Lafayette Road. Are you a local federal employee that's been impacted by the government shutdown? 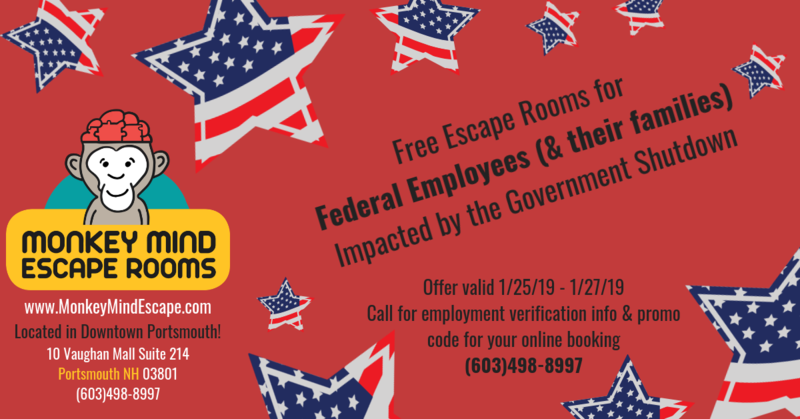 Free escape rooms for federal employees (and their families) impacted by government shutdown. Offer valid 1/25-1/27. Call for employment verification and promo code for your online booking. (603) 498-8997. In response to a potential government shutdown that may result in work furloughs for many of its members, Northeast Credit Union (NECU) has announced the availability of several special programs to assist federal workers and their families that may be affected by the government shutdown. The programs will be offered throughout the duration of the government shutdown and includes deferments for up to three months on NECU consumer loans, a special low-rate on a 12-month Signature Loan with deferred payments, and continuation of direct deposit pay at the member’s request. Friends and neighbors! Starting Saturday, 1/19 we will be offering government employees who come in and show their ID a complimentary meal until the shutdown ends during lunch and brunch only. Choose from a Crispy Fish Sandwich, served with chips and slaw, or a Bacon Cheddar Burger served with caramelized onions (one per person). Seacoast Rep is here to entertain. Seacoast Rep is offering two free tickets for each impact federal employee during the furlough with proof of employment. Six seats will be reserved per show with additional seats if available. To view upcoming show please visit SeacoastRep.org. Seacoast Science Center would like to help families affected by the shutdown. While the shutdown lasts, we will offer free admission for families who show a federal employee ID, giving them a place to go that won't cost money and will fill time with something positive until they can get back to work. Seacoast Science Center is open every day from 10am-4pm. Are you a government employee affected by the shutdown and need assistance? We may be able to help. Our approach is to help each affected member with individualized support. Support may include loan payment deferment of two months, a personal loan, and penalty-free access to certificates of deposit. Please contact our Member Contact Center for information and guidance. Call 1-888-786-2791. We care about our federal employees and we want to help. TD Bank Customers who are federal employees, contractors or receive federal benefits can enroll in the TD Cares Payment Assistance Program to help meet day-to-day financial needs during the partial government shutdown. TD Bank is offering a Payment Assistance Program if impacted by the partial government shutdown along with access to additional funds at no cost, late fee refunds on most TD Bank Visa® credit cards, loan assistance, and small business loan assistance. To learn more about these programs visit TD.com or visit your local TD branch. Attention Coast Guard... No shut down here at Beach Pea! To our amazing men and woman of the Coast Guard, the people that protect our harbor communities each and everyday. We thank you and want to show our support! Just come on in and show your active Coast Card ID and have a coffee, loaf of bread or even a sandwich or salad...it's on us! If you are a government employee affected by the shutdown, Fat Dog Kitchen in Dover is offering 25% off your check. Furloughed government employees in the area, if you need a place to blow off some steam, visit with us. Your membership to our gym, Proven Performance Center, Home of EverProven CrossFit, will be covered until the shutdown ends and you see a paycheck. Proven Performance Center has locations in Dover and Exeter, NH. 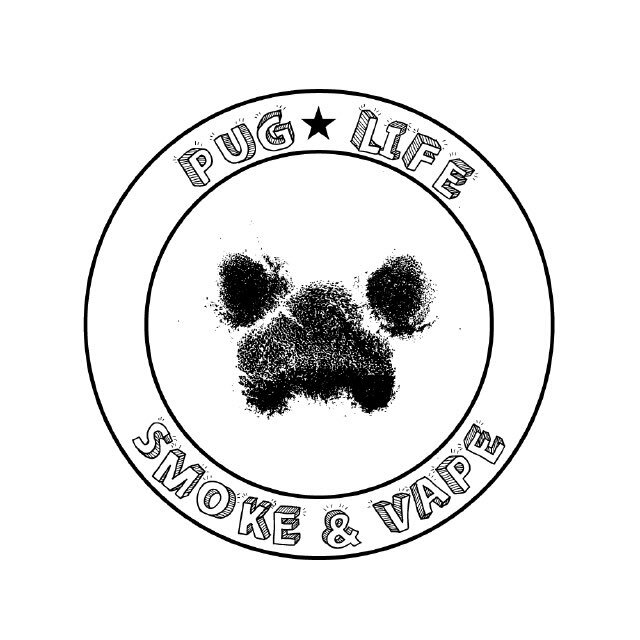 Pug Life Smoke & Vape is collecting pet food (dry & wet) for anyone affected by the government shutdown. Stop in if you need a hand keeping your pet healthy. We will be accepting cash donations as well that will go towards Pug Life buying more food or gift cards. Goodie bags are available for people who donate. Visit us at 71 N. Main St. in Rochester. Vanity Hair Studio is offering 40% off retail products (shampoo, conditioner, etc) and 25% off all haircuts for those who are not being paid during the shutdown. We are located at 33 Deer St., Suite 3A in Portsmouth. This is valid during the government shutdown and to those affected by nonpayment for their work and services for our country. A valid government ID is required. Visit them online vanityhairstudionh.com or call at (603) 430-8689.